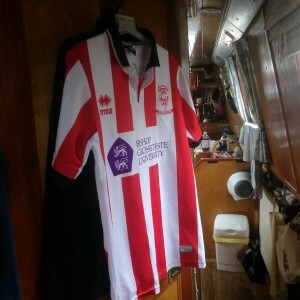 Narrowboating Chick | Pennine Weather and the Huddersfield Broad. Being in such close proximity to the Pennines, always means that the weather is subject to rapid change. From last night’s early evening cruise in the sunshine and my ramblings about our efforts to stay cool in the baking sun, we woke to the sort of drizzle that comes and goes as the clouds drift past. A Break in the Drizzle on the River Calder. The drizzle eased and allowed is to enjoy the river in gloomy but dry circumstances. Off at Anchor Pit flood lock and we caught sight of another boater in front, moving quite slowly. As we approached the first lock, another boat was untying, as they had set the lock. We were quite happy to hang back and wait our turn, but it was slow progress through the two locks. 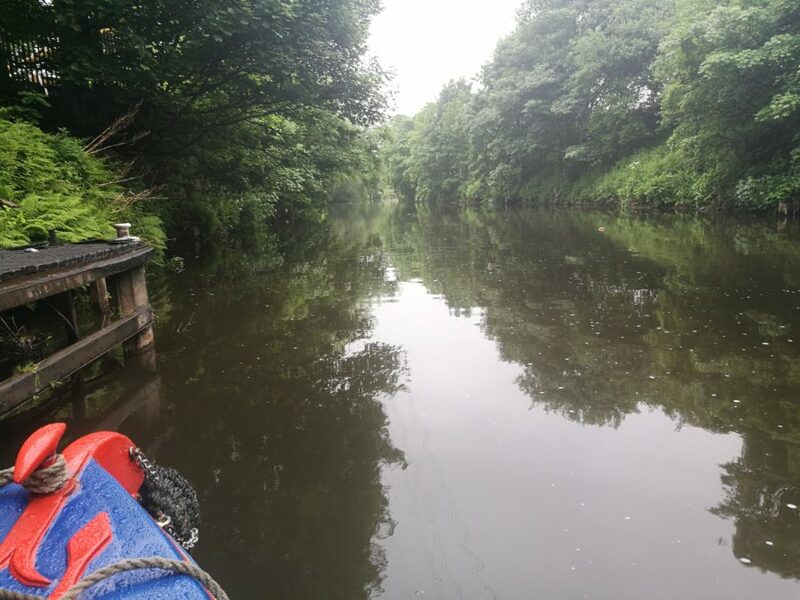 Back on the Calder, we were looking forward to exploring new territory on the Huddersfield. 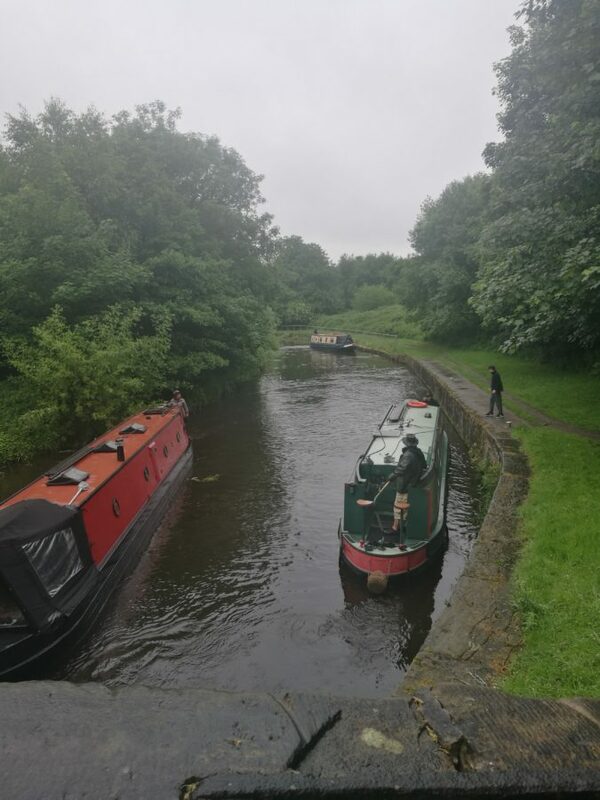 We caught up with one of the other boaters at the bottom of the first lock of the Huddersfield Broad Canal. The lady was a single hander, so we shared the locks. 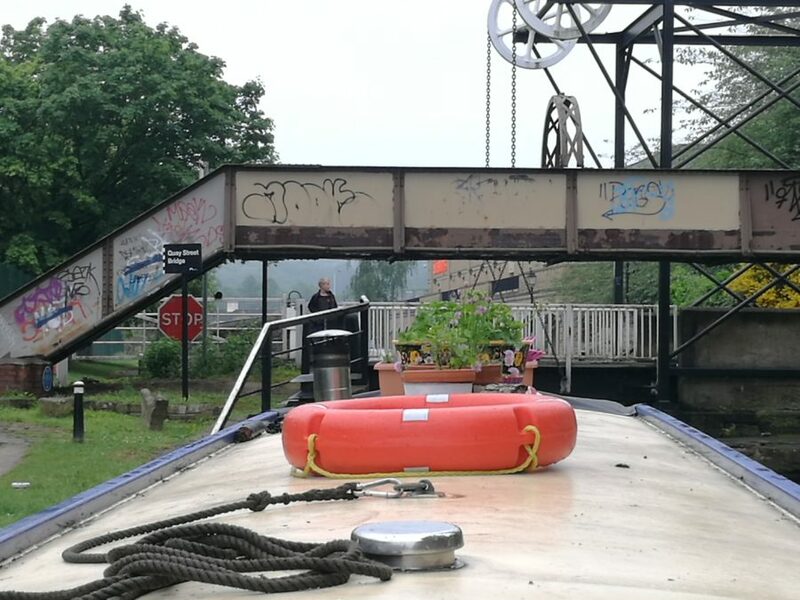 It took a while to get into our swing…so many different things to get used to: another boat in the locks with us, heavy/different gates, different paddle gear and a new way of unfastening the anti vandal key on the paddle gear. Needless to say, we found our routine and by lock 4/5 we were well into our usual efficiency routine and we all had our mojo. A boat coming the other way eased the burden somewhat, as then all our locks were empty. Passing a Boater on the Way Up. I took over steering 2 locks from the bottom- my feet were wet and soggy and the wetness was creeping up my trouser leg. I was ready for the end, as I’d been thinking about the big bowl of pasta we all deserved. Once at the top of the locks, we were about a mile from the moorings. Huddlesfield Town FC ground came into view a bit better-quite fitting as the Club was playing at Wembley today for the play off place in the Premier League. Once moored up, the big bowl of pasta didn’t disappoint. Our clothes were changed, the fire was lit and our well deserved meal was thoroughly enjoyed. Sometimes, it’s all about dry clothes and a simple bowl of pasta. Happy Bank Holiday.